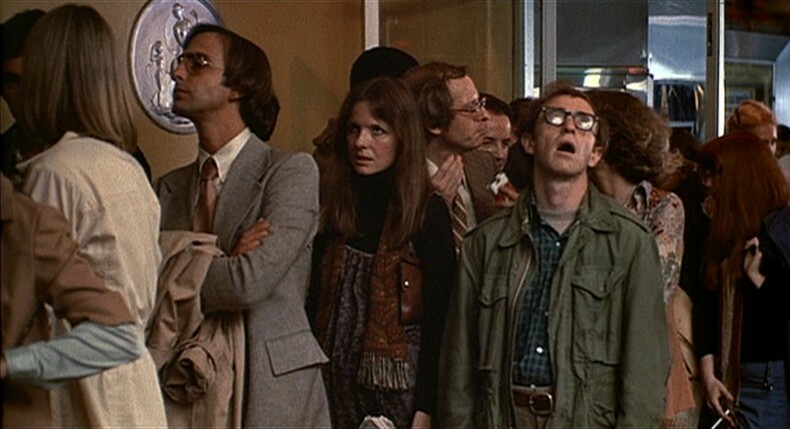 In Alvy’s opening monologue, the audience is bombarded with broad, Jewish-themed jokes that are then applied to the characters. The camera gives the audience a straight-on view of Alvy, thick-rimmed glasses and all, talking about two famous Jews, Groucho Marx and Sigmund Freud, both of whom were strong proponents of Jewish humor. One of the jokes worth dissecting involves two older women “at a Catskill Mountain resort.” One woman complains about the quality of the food, while the other agrees and adds by saying “what small portions” they give. Within all of these references, it appears Alvy is paying homage to the “Borscht Belt” of old, which was a place within the Catskill Mountains where Jewish comedians could work in front of “largely Jewish audiences” (“Jewish Humor” 313). But, with this being the audience’s first interaction with Alvy, it seems he believes that he is either speaking to a heavily Jewish audience, or the more credible view, that the only way he can vent the “challenges of modern life” and his thoughts on relationships are through the lens of other Jews (309). To be more specific, it helps him articulate what it is like to be a Jew in a Gentile world. As stated to Annie on one of their first official dates, Alvy believes that life is divided into two categories: “the horrible and the miserable.” For this reason, he appropriately buys her two books to read, Denial of Death and Death and Western Thought. Annie doesn’t seem overly interested in reading these depressing books, which highlights a very key piece of Alvy’s Jewish makeup. Kvetching, or whining, is an integral part of Jewish culture and asserting he is alive. Therefore, Alvy saying that every part of life is “miserable” highlights his Jewish tendencies and his outlook on life. But, Annie’s inability to see this shows the complete difference between Gentiles and Jews. Perhaps it is for this reason he cannot partake in the dangerous vices of drugs or drink alcohol, for becoming intoxicated — or “unbearably wonderful” — will give him nothing to kvetch about. However, Alvy tries to shed the label of a Jew and assimilate to the dominant society. Alvy’s dinner with the Halls seems to be one of the most critically discussed scenes within the film. This is the infamous scene when the Halls serve Alvy pork. It also shows Alvy’s attempt to assimilate, as he accepts the “dynamite ham.” Here, he is betraying Jewish customs that prohibit non-kosher foods in attempt to be like the Halls. The same can be viewed during the beach getaway with Annie that involves cooking lobster — another non-kosher food. Though he deems them “disgusting,” pinching them with only two fingers and at different points using both a boat oar and a metal grated spatula to avoid touching them, it is implied he still eats them. He even goes as far as putting a Christmas tree into his apartment with Annie rather than a menorah, proving that there are efforts on Alvy’s part to assimilate into the dominant culture. However, regardless of whatever pieces of the culture Alvy gives up, he is unable to escape being a Jew. Referring back to the dinner scene with the Halls, Allen uses this shot to show that no matter how similar Jews and Gentiles appear, there is always that inherent distinction. This is accented perfectly when there is split screen between both the Halls and the Singers, thus opening up dialogue between the Jewish and Gentile community. Volume aside, these are merely two families sharing conversation over dinner. Just as Mother Hall (Colleen Dewhurst) talks with Annie about mutual acquaintances, Mrs. Singer (Joan Neuman) is doing the same with her family members. Father Hall (Donald Symington) and Mr. Singer (Mordecai Lawner) even come to the mutual realization that they do not understand the “sins” that must be atoned for, sins that nobody seems to define. Ultimately, even with these similarities, there is still a great difference between Jews and non-Jews, both in appearance and personas. This difference is epitomized when Alvy is depicted as an Orthodox Jew at the Hall’s table, either by Grammy Hall or by himself. The source of this labeling is ambiguous for multiple reasons. Though she is known as a “Jew hater,” It is highly unlikely Grammy Hall crosses paths with many Orthodox Jews in Wisconsin, proving she would not know what one looks like (Davis). Therefore, this could be the way Alvy sees himself being viewed by everyone else. Regardless, he is still the Jew at a table full of Gentiles. 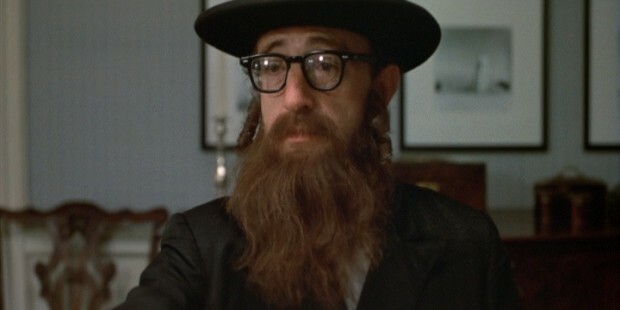 Alvy Singer depicted as an Orthodox Jew. Though New York seems to be the focal city in “Annie Hall,” Allen’s treatment of Hollywood deserves the same amount of scrutiny. Even with Rob’s (Tony Roberts) proposals to move out west, Alvy refuses. However, after being worn down, he agrees to be like others that “sold out” and make the trek to California to host an award show. With this harsh language toward the West Coast, it becomes clear that Alvy is not one to join the mainstream entertainment industry, or “make a right turn on a red light.” While there, Hollywood seems unbearably shallow after one anonymous filmmaker claims that he has a “notion” and that with “funding” it can become a “concept” and, hopefully, someday an “idea.” By using synonyms of the same word and believing there is some kind of differentiation, Allen shows Hollywood in a disparaging light that is out of touch with filmmaking as an art form. Between this, the actor (Jeff Goldblum) making a phone call because he forgot his “mantra,” and the “immoral” use of a laugh track, the audience seems to side with Alvy’s earlier claim that Hollywood turns their “garbage… into television shows.” Underneath all of the hollow practices and forgotten mantras, it is important to note just exactly what group Alvy is trying to distance himself from. As stated in his book, An Empire of their Own: How the Jews Invented Hollywood, Neal Gabler states that the founding father of Hollywood’s major production studios, “Mayer, Cohn, the Warner Brothers, Fox, Zuckor, [and] Laemmele” were all Jewish ( Chafetz 451). This would coincide with his disgust toward Tony Lacey (Paul Simon), who according to Gerald Mast can “represent… a Jew transported to Hollywood” (134). Alvy is not looking to to be apart of a place where typecasting and genres, and thus labeling, are common place. Alvy living in Los Angeles would undoubtedly result in him being labeled as another Jewish Hollywood mogul. So, Alvy — and thus Allen — must try something unique. The presentation of “Annie Hall” proves that it does not conform to the same standards as other films. The progression of Alvy and Annie’s story is completely non-linear, as the audience is taken through a series of flashbacks and memories. When seeing Alvy and Annie fight over her spending time with a college professor, there is a flashback within a flashback, yielding Alvy’s side-by-side and contradictory remarks about adult education. This gives the film, as Thomas Schatz calls, a “metaphoric pattern” that goes against the “sequential” design of classical Hollywood films (184). This ties in with Alvy’s, and Allen’s, personal choice in films. From the constant viewing of the French movie “The Sorrow and the Pity” (1969), which comes as the back up to seeing Swedish director Ingmar Bergman’s “Face to Face” (1976), to his defensive nature when Italian filmmaker Federico Fellini is criticized, Alvy holds non-Hollywood filmmakers in high regard. This translates over to Allen’s treatment of his film. Still, no matter how hard Allen tries to distance his film and his characters from Hollywood, “Annie Hall” received four Oscars, including one for Best Picture in 1977, essentially garnering him all the praise and accolade of the supposedly shallow Jewish influences that only “give out awards,” according to Alvy. Even Alvy’s need to be in New York, proven by him becoming physically ill when visiting Los Angeles, places him within the city where European and Russian Jews — potentially even Alvy’s grandmother, who was “raped by Cossacks” — immigrated to. Therefore, no matter what side of the country Alvy chooses to live on — even when he’s in Wisconsin with the Halls — he will always be in touch with different parts of his Jewish identity in one way or another. “Annie Hall.” IMDb. IMDb.com, Inc. n.d. Web. 12. Nov. 2014. Chafetz, Saltzman. “An Empire Of Their Own: How The Jews Invented Hollywood (Book).” Contemporary Sociology 19.3 (1990): 450-451. SocINDEX with Full Text. Web. 5 Dec. 2013. Davis, Kimberly C. “Annie Hall.” Bridgewater State University. Hunt Hall, Bridgewater, MA. Fall 2013. Lecture. “Jewish Humor.” Norton Anthology of Jewish American Literature. Ed. Jules Chametzky. New York: WW Norton, 2001. 309-318. Print. Mast, Gerald. “Woody Allen: The Neurotic Jew as American Clown.” Jewish Wry: Essays on Jewish Humor. Ed. Sarah Balcher Coehn. Bloomington: Indiana UP,129-140. Print. 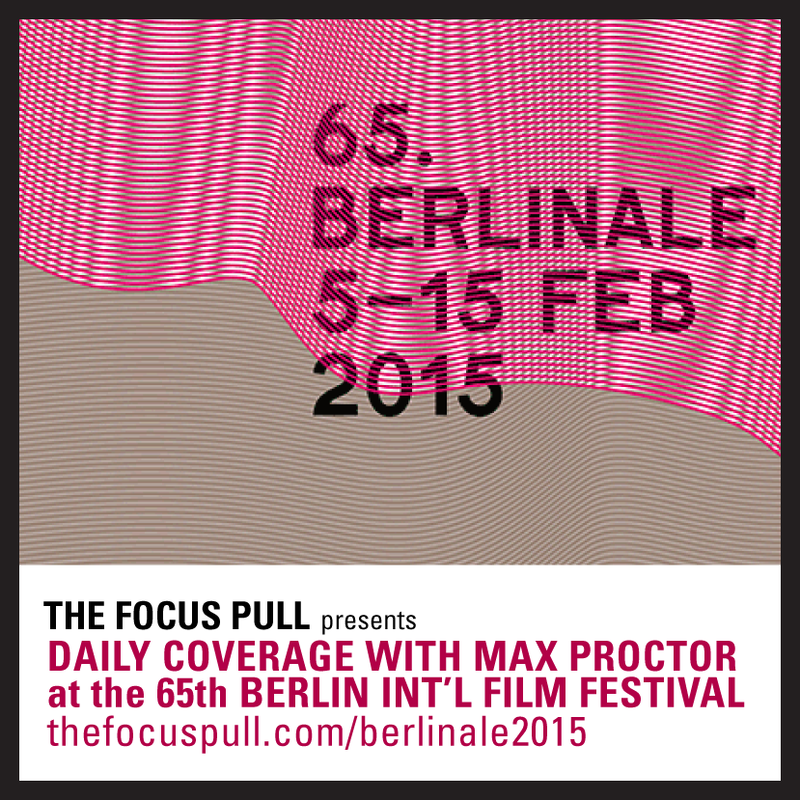 Editor's Note: It can be overwhelming to approach a historic filmmaker's catalogue of work. Our "Where to Start" feature calls attention to the most essential films by a director with a notoriously large filmography. Catch up with these five films and you'll have a solid understanding of the director's style, appreciation for their notoriety, and a few speaking points for any discussion on cinema.